A few days ago, I had a random thought: what would googly eyes look like on the light table? Yes, that's what this creative mama thinks about while she goes about her day. 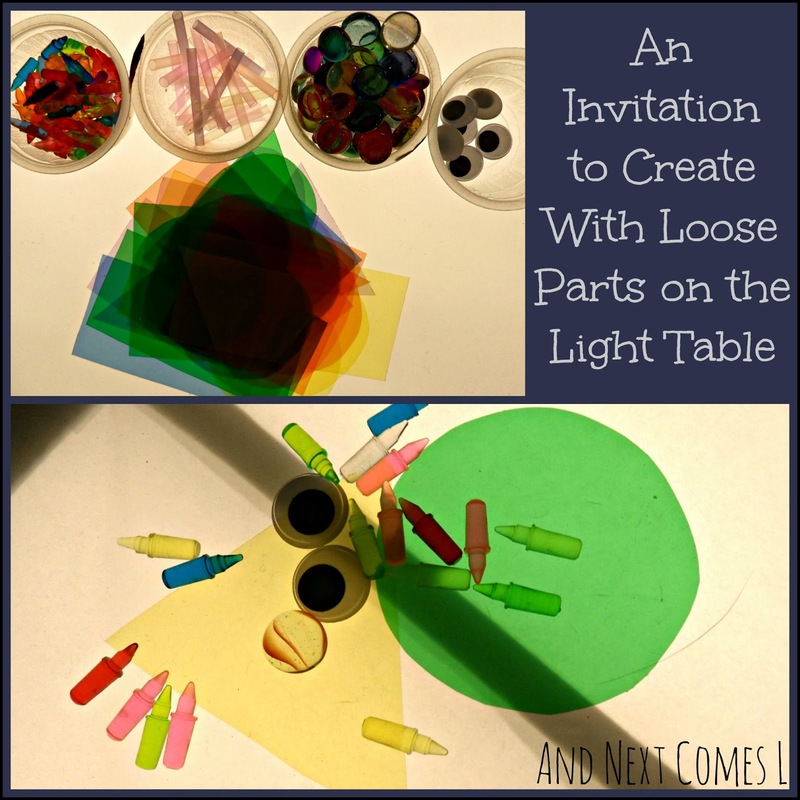 Well, I discovered that they look pretty cool on the light table, so I put together this invitation to create using loose parts on the light table. I set out a cup of googly eyes, an assortment of light bright pegs, some cut up straws from this activity, some colored glass stones, and the homemade light table shapes. Then it was time to create! The boys ended up using the materials to create some adorable little monster-like creatures, like this one of J's that uses a little bit of everything. I think this one is super adorable! K was more of a creative mastermind. You know, one of those ones who absolutely refuses to do any actual work. He would hand me an item, point to where he wanted it, say "right dare" (toddler version of there), and insist that I build the monsters for him. Who am I to refuse a persistent, and oh-so-cute toddler? So here are some monsters that he and I made. After K lost interest, J asked me to keep playing along, so together we made some robots (or perhaps they look more like aliens?). And to think it also started with googly eyes!